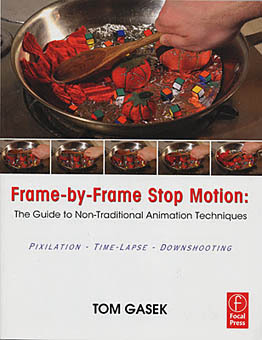 A new book just hot off the press and maybe not noticed yet and still under the radar, called ‘Frame by Frame Stop Motion: The Guide to Non-traditional Animation Techniques’ by Tom Gasek. I remember Tom waaay back in the late 1980’s … he was one of the animation directors of the ‘New Adventures of Gumby‘ TV series shot in Marin County, California. Stop Motion has varieties of sub-categories & styles, and you are now seeing them all over the internet and ads. The quality of these animations varies of course. For many, a hands-on creative outlet and not necessarily to win awards. The ‘all puppet’ animation forms (the Coralines & Fantastic Mr. Foxes style) and the Harryhausen-esque (stop mo mixed w/ live action) might be too complex or beyond the capabilities of the average person, however, that should not exclude people if they wish to partake in some form of animation creative outlet. This would include, Pixilation, Cut-out, Object, Silhouette and other forms of non-traditional frame-by-frame animation (stop motion) methods. I want to send you an award for most heflpul internet writer. THANK YOU! for posting this. I attempted to notify the stopmotionanimation forums community on this but I think most paid no mind. Glad to see Tom’s book get some recognition. If your comment does not appear, do not worry. Our 'filters' at work and your post likely awaiting approval. If you are concerned, 'Contact me' and I will find your original post.